NETWORK UPDATE: SUNDAY NIGHT FOOTBALL adjusted up to 7.0, up 0.3 from last week’s game. 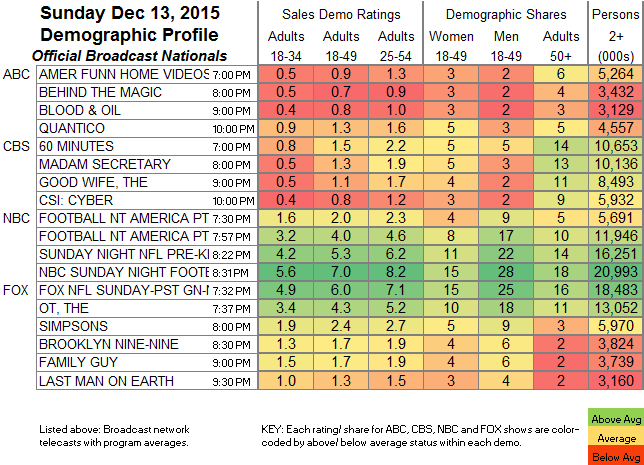 At least BLOOD & OIL departed with a shred of dignity, gaining 0.1 in final numbers, while 60 MINUTES lost 0.1. CABLE HIGHLIGHTS: It was Bravo’s REAL HOUSEWIVES OF ATLANTA at the top of Sunday cable, down 0.05 from last week to 1.39, and still dwarfing lead-out WORK OUT NY, which was down 0.05 to 0.32. AMC’s INTO THE BADLANDS was steady enough in its 2d non-WALKING DEAD week, down a tenth to 0.96. On E!, KEEPING UP WITH THE KARDASHIANS dropped 0.16 to 0.90, and THE ROYALS lost 0.03 to 0.28. (Note that ABCFamily’s Sunday movie was a run of the theatrical TOY STORY 2.) 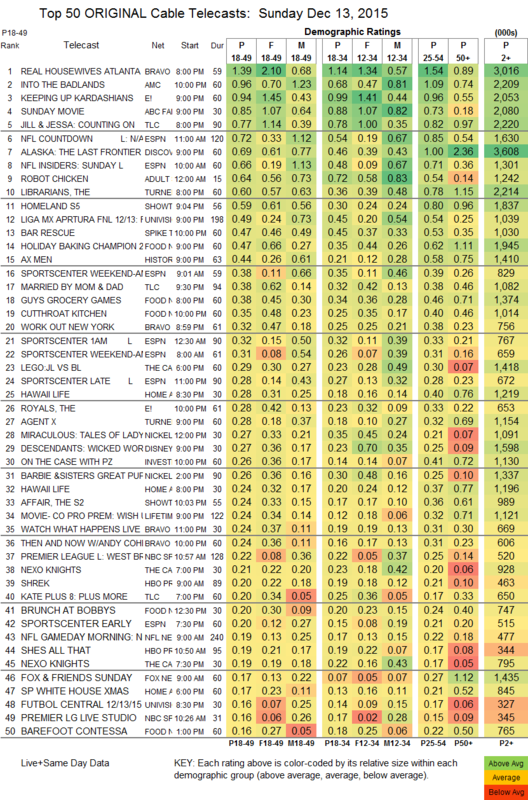 On TLC, JILL & JESSA premiered at 0.77, followed by MARRIED BY MOM & DAD at 0.38. Discovery’s ALASKA: THE LAST FRONTIER fell 0.12 to 0.69. Adult Swim’s ROBOT CHICKEN climbed 0.12 to 0.64. (Note that someone wrote in to say that MIKE TYSON MYSTERIES was mislabeled as a rerun by its network, and in any case it was at 0.53/1.02M.) On TNT, THE LIBRARIANS continues to be quite strong, up 0.06 to 0.60, and AGENT X gained 0.08 to 0.28. Spike’s BAR RESCUE was up 0.11 to 0.47. On Food Network, HOLIDAY BAKING CHAMPION eased by 0.02 to 0.47, GUY’S GROCERY GAMES was steady at 0.38, and CUTTHROAT KITCHEN was up 0.04 to 0.35. On Logo, RUPAUL’S GREEN SCREEN premiered at 0.03/94K. Showtime’s HOMELAND didn’t take advantage of there being no LEFTOVERS competition, slipping 0.04 to 0.59, while THE AFFAIR downticked to 0.24. HBO’s only original for the night was GETTING ON, down 0.01 to 0.08. Starz’s FLESH & BONE was also down 0.01, to 0.03/73K.